Cook at Camont with Kate Hill and other guest teachers in small very hands-on classes of 6-8 students featuring the best of local Gascon products grown by our neighbors and farms--from seeds to sausage. Five days of cooking with Kate Hill at Camont will change the way you look at food, cooking, and eating forever. Learn the Classic Cooking of Southwest France and Gascony from its abundant, local, and seasonal produce. Each day's class begins with understanding the best raw materials, learning classic French cooking techniques as Kate shares her own easy approach to defining your personal cooking style. Invest in your own life skills and experiences the creativite Kitchen at Camont. Day Classes are easy, seasonal, fun, and focused on special projects like Easy French Butter Pastry, Kate's Gascon Mother Sauces, Summer Vegetables, or Duck Cookery. We start the day at the farmer's market returning to Camont's well-lit Teaching Kitchen for hands-on learning. Recipes are seasonal, easy, and delicious as Kate shares her small tips and approachable style to cooking good French food, everyday. Suitable for small groups. Why not come for a day or two while on vacation in the area? Since 1991, Kate Hill has organized and led special gastronomic tours and road trips across France and the rest of Europe. She created 'Insider's Gascony', 'Basquelandia', and new in 2018- Insider's Andalucia with photographer Tim Clinch. Join us for one of these special road trips for very small groups of like-minded friends, staying in small and grand hotels, eating in starred restaurants and little cafes. Take the time to saunter the old streets of Europe's favorite cities and villages. Join me at the Table! Gascony, Andalucía, and Catalunya pull me to their colorful tables where conversations flow and life slows to different speed. This year I am offering three different Insider’s RoadTrips to share the savory moments of life afar in the company of new friends. Join me in the South of Spain in May, or North in Catalunya in the late Summer/early Fall. The rest of the year, I am here in Gascony. See below for more details. Five Day Pastry Workshops April & June with Molly Wilkinson! Imagine a charming week in the French countryside for those that dream of sugar clouds: Meringues! Macarons! Tartelettes! & More! Dive deep into the nuage sucrée of Pastry Chef Molly Wilkinson on a five day romp through the classic world of delicious French Pastries. Learn to make all of these and more with Molly! Sign ups are now open for April and June. With just 8 people in a group, these special weeks sell out fast! Interested in a week or two French vacation in the charming stone Pigeonnier at Camont? Now booking for Summer 2019- July 13-Sept 14. Two bedrooms each with private bath, sitting room, my own fantastic kitchen, garden terrace, and one acre parc including French hens. Read more about staying at Camont here. 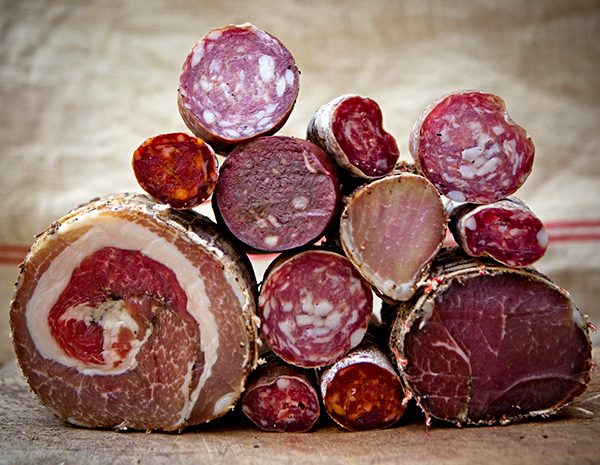 Camp Charcuterie is a week-long course delivered at Camont in Gascony, Southwest France, for students interested in creating all or part of a seed-to-sausage French charcuterie program: rearing pigs, butchery, charcuterie and added value products. This foundation course taught by Kate Hill includes: butchery and whole carcass breakdown for charcuterie; the production of traditional French raw, cooked, and whole muscle charcuterie. Kate Hill has been teaching butchery and charcuterie at Camont since 2008. Her students own and operate the best of the new groundbreaking artisan charcuteries in the United States, Canada, Australia, Peru, Korea, and South Africa.